Art and Science are probably not two disciplines you would think about merging when approaching the fight against climate change. 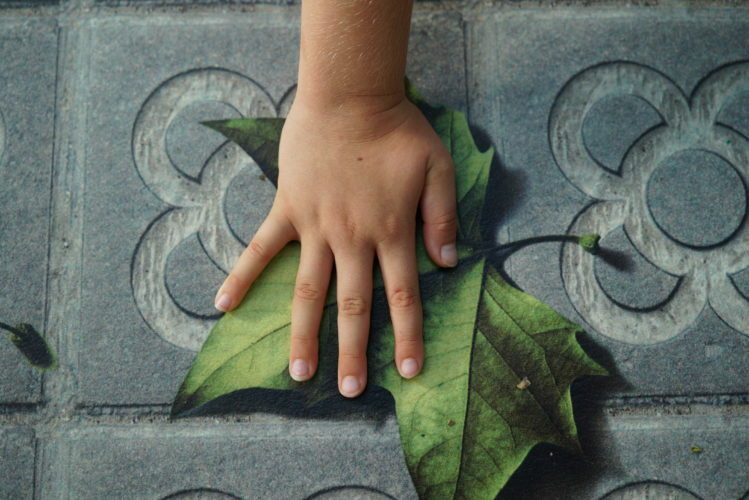 However, creativity and art have great potential for effectively tackling today’s environmental challenges. As a graduate of both Environmental Science and Fine Arts myself, I have come to find a certainly fruitful relation between both disciplines first-hand. Studying about nature and the threats of climate change had a strong influence on my artistic work, which increasingly turned into a way of denouncing environmental threats and a call for action. Art, at its turn, enabled me to look at such menaces from a creativity-based perspective, allowing me to identify multiple feasible solutions to climatic issues. Out of all the scenarios where art and science can complement each other, this synergy sees its best resolution within the context of a city. And here are 10 examples. 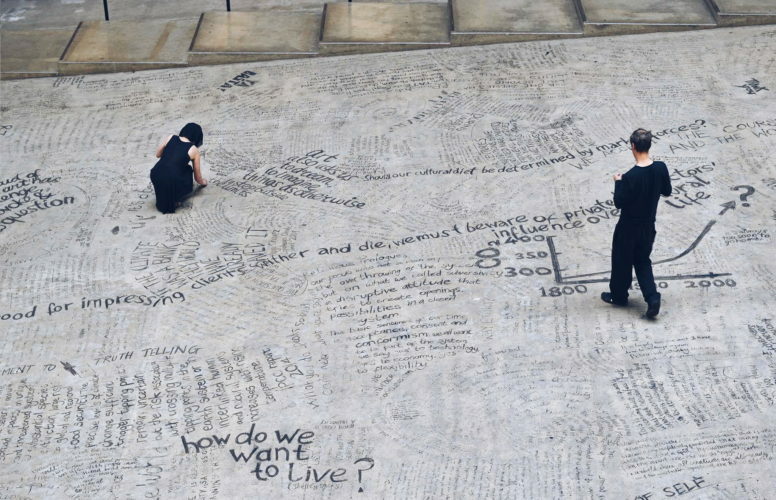 Several artists have taken the streets to complain about current ineffectiveness to tackle climate change. 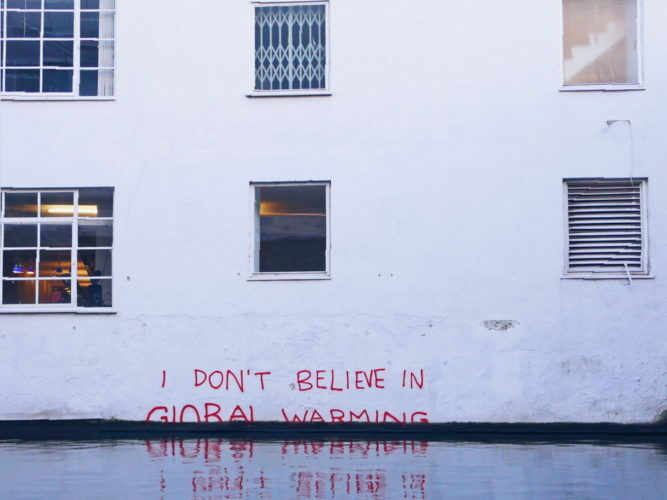 A hand-written and half-submerged ‘I don’t believe in global warming’ was Banksy’s way of denouncing the poor negotiations that Copenhagen’s COP15 had accorded, an art piece that rapidly reached millions of people through international press. 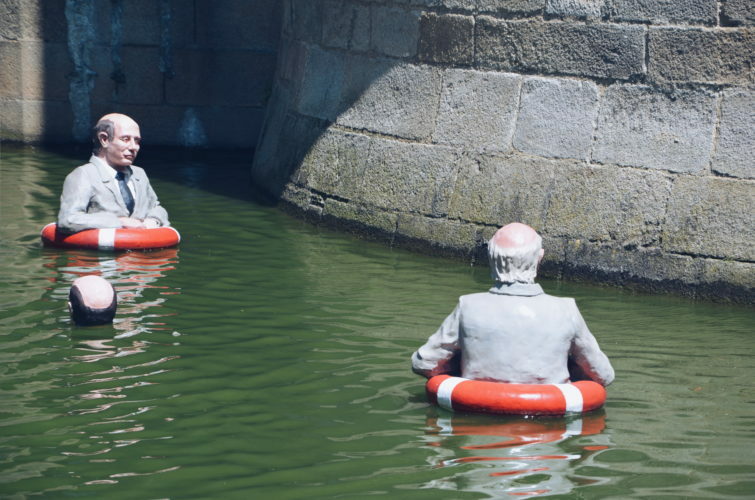 The lack of political will when approaching the effects of greenhouse gas emissions was also Isaac Cordal’s inspiration for Waiting for Climate Change, a piece of art consisting of multiple figures in business suits almost covered in water in Nantes. 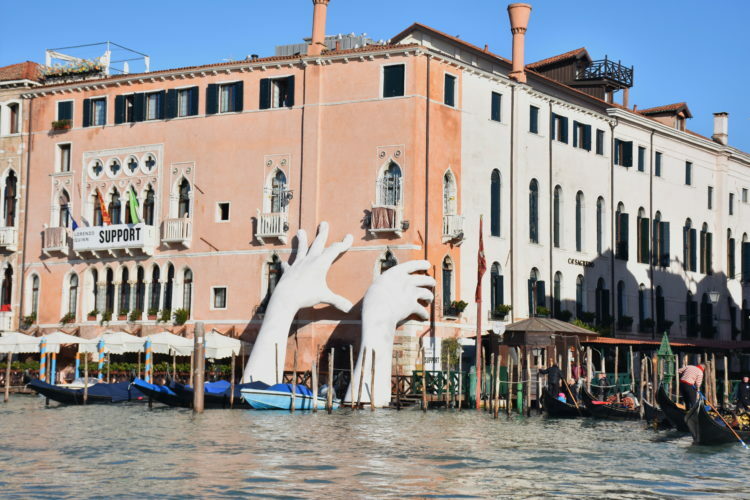 This was also the inspiration behind Lorenzo Quinn’s Support piece, which displayed two giant hands trying to emerge out of the water in Venice during its 2017 biennale. But artwork like Kasia Molga’s Human Sensor, an armour-looking custom that emits various kinds of light depending on the city’s air pollution, proves that the multiplicity of forms that artists can find to make their point is limitless, just as their potential. 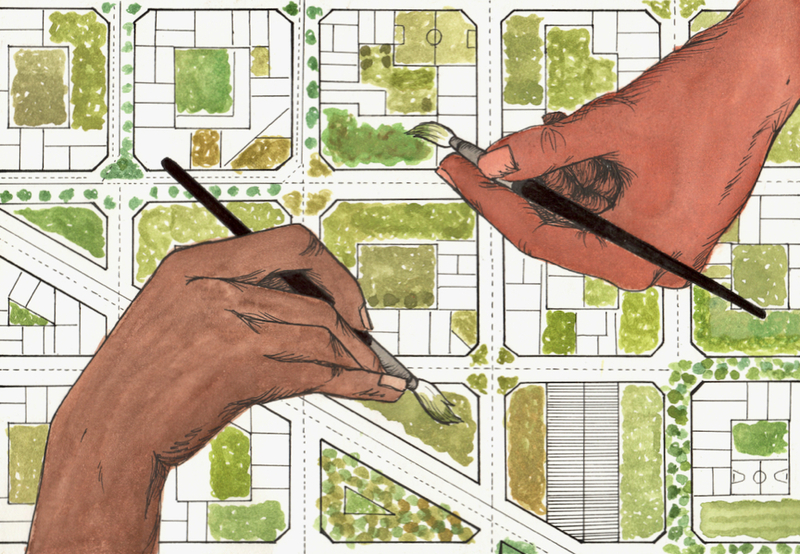 It only takes one citizen to put into practice an idea that reaches thousands, but it doesn’t take many more to start a local revolution involving entire neighborhoods. In 2008 Pam Warhust and her friend Mary Clear were sitting at Pam’s kitchen in Todmorden, UK. They asked themselves: what could we do to better our community? Multiple meetings with their fellow villagers later, they took matters into their own hands and started growing vegetables in disused public land portions and verges. 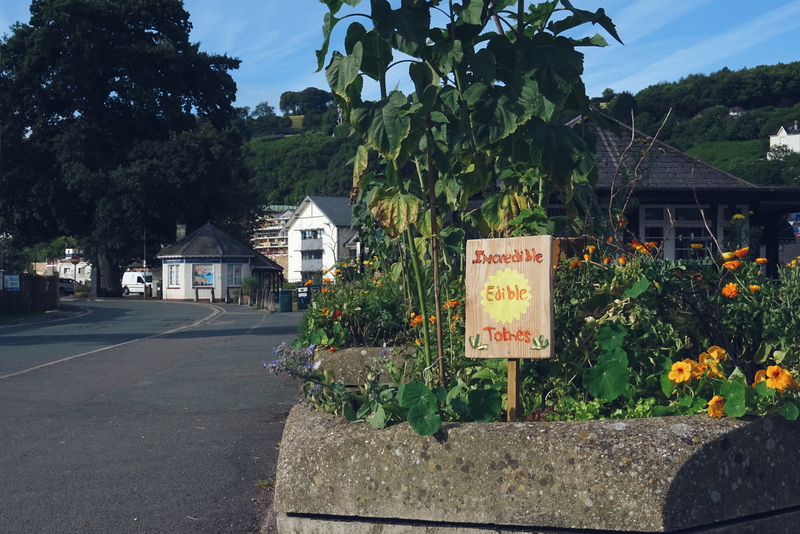 The most artistic villagers additionally created designs for those raised beds, to explain what was growing there in an appealing way. 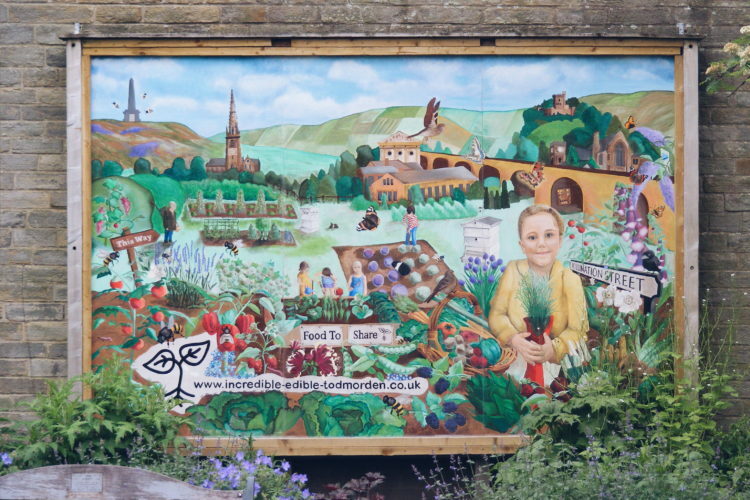 This inclusive project, named Incredible Edible, eventually was accepted by local authorities and inspired the creation of 500 community further groups that are currently active around the world. 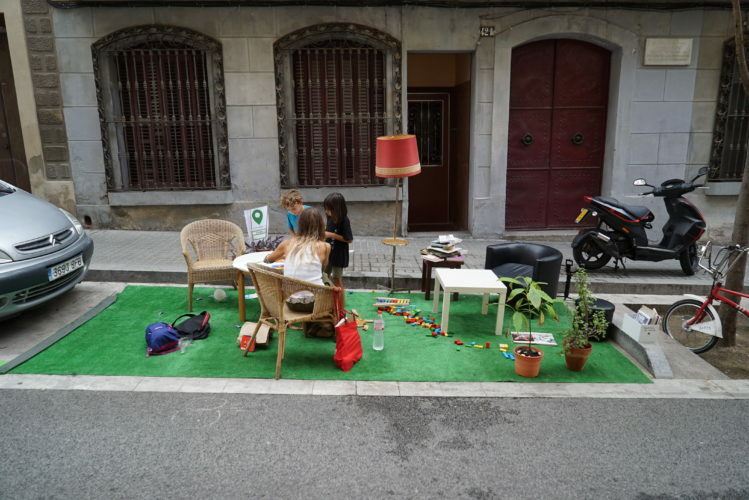 On a more sporadic note, Park(ing) Day is a yearly event that has widespread worldwide since it began in 2005, when a San Francisco art & design studio occupied a parking spot with a bench, a tree and sod, as a way to denounce the lack of public space in that region. Multiple cities around the world have implemented this project one day per year ever since, local community’s needs . 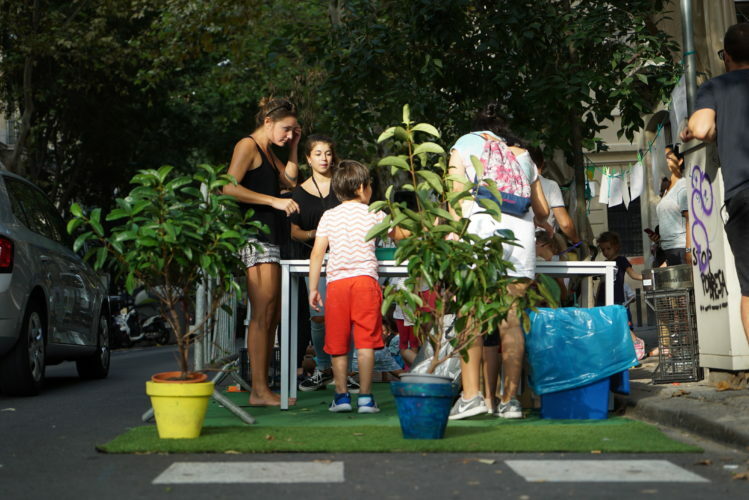 Barcelona, for instance, welcomed the ideas of 40 local entities that turned 812 m2 of parking spaces into cinemas, meeting rooms, concert venues and playing areas on its 2018 Park(ing) Day edition. 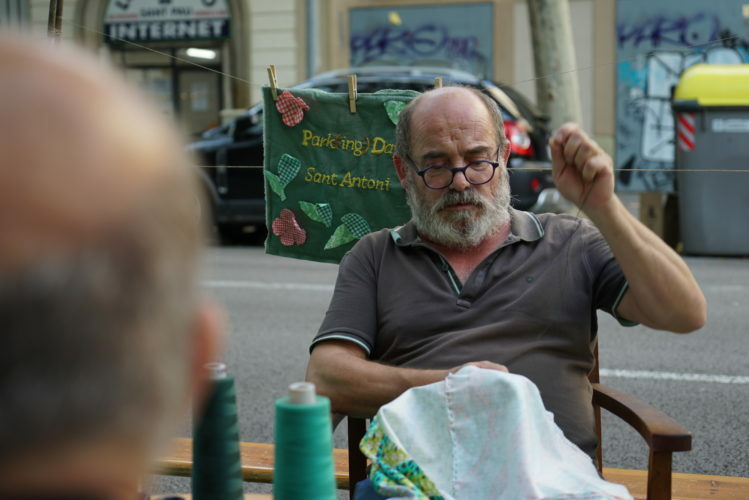 And while neighbors are great allies when it comes to collectively fighting for a better planet through creativity, artistic cooperation can take many forms. Take Liberate Tate, for example. This art collective was founded on 2010 to unitedly fight against the funding of cultural institutions from oil companies, mainly focusing their actions on the art gallery Tate Modern in London, UK. After carrying through numerous performances inside the museum, Tate’s sponsorship from oil companies successfully ended in 2016. City governments have a significant role in making climate action become the norm, and in embracing the ideas and creative potential from their citizens. Here is where initiatives such as City Labs come into play. Mexico City’s Laboratorio para la Ciudad, active from 2013 to 2018, is a truly representative case. As a space designated to welcome all city actors and inhabitants to jointly explore urban creativity through participation, it marked out the path to cocreate an open, creative and global city. Cultural Institutions, in turn, are decisive in the task of flagging concerns that require social articulation too. 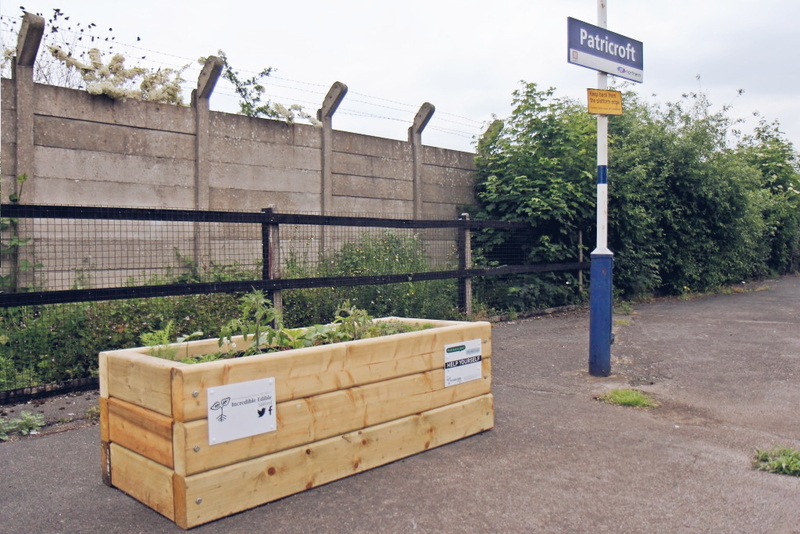 They have the power to situate climate change at the centre of the city’s priorities. Additionally, they provide new perspectives that visitors can then reflect on or apply into their everyday lives. I am thinking of Barcelona’s CCCB cultural institution and its After the End of the World exhibition from 2018, for example. This expo explored the future of our planet in 2100. In this fictitious scenario, resources were scarce, CO2 had been cut, and planet Earth was unrecognizable. Both terrifying in the projections it shared, as well as encouraging on the feasibility of its solutions if tackled innovatively, it provided hints of fear, hope and a sense of urgency that certainly must have inspired many visitors to explore their role in this critical transition. Art and creativity can bring visibility to the problem: Although climate change and its devastating consequences are considered major threats worldwide, media coverage has diminished in the last years. In light of this situation, art and its emotional impact can reach more citizens and bring awareness to this challenge. It makes it less scary: The discouraging and never-ending array of negative news related to global warming can lead to a higher alienation amongst citizens. By sharing the urgency of the issue through a collaborative and cheerful approach, artists can actively engage citizens into wanting to be a part of the solution, rather than seeing it as an insoluble dilemma. Proximity sparks creativity: Cities are innovation hubs where professionals from the most diverse fields of expertise gather, including artists who can envision hypothetical futures and scientists that can find practicable ways of implementing such possibilities. There is really nothing to wait for, nor a specific position from which action can only effectively take place. 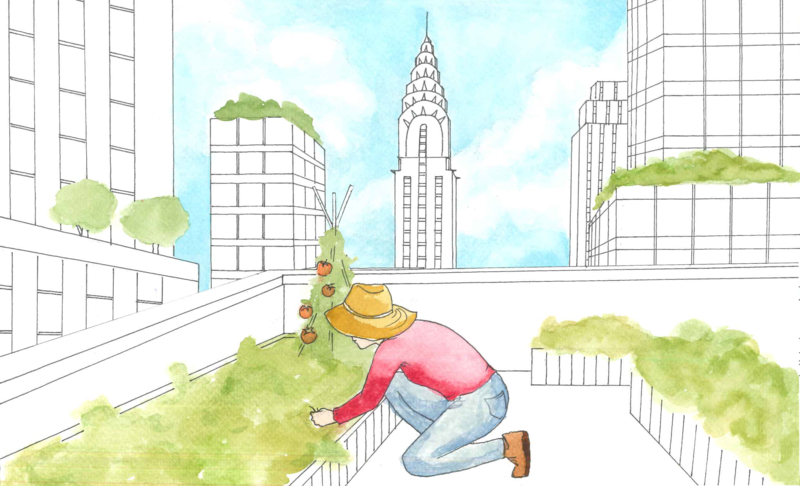 Each of us is already equipped with all we need to question the system and responsibly foster the transition towards more sustainable cities from the places where we live. And if, while we’re at it, there’s a way to approach the mission creatively; if we could on top of that join others and make it fun… why wouldn’t we? Mons Badia holds a BA in Environmental Science (University of Barcelona and Norwegian University of Science and Technology) and a BA in Fine Arts (University of Barcelona). 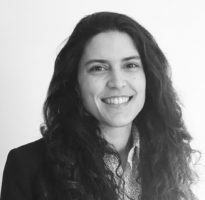 She is a Consultant at anteverti, and is part of the team managing the contents for the Smart City Expo World Congress. Before joining anteverti, Mons worked in the consulting company Inèdit, at the Department of Evolutionary Biology, Ecology and Environmental Science of the Universitat de Barcelona and at the United Nations Global Compact in New York.